I have a good friend who loves to dig through the depths of Amazon Prime’s horror movie selection. Over drinks, he enjoys telling me of the strangest ones he’s seen or even the ones with the oddest-sound scenarios. Does he enjoy any of these movies? Probably not. Does he ever listen to my recommendations for good films that he will enjoy? Never. 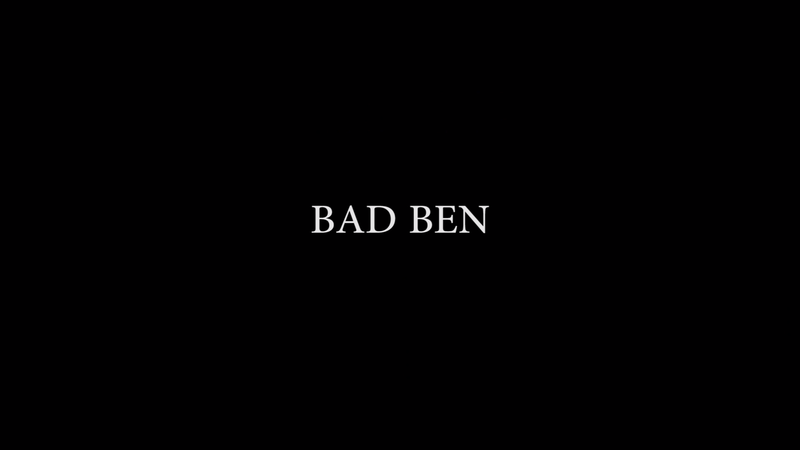 But easily the most intriguing film series he told me about is Bad Ben. Now this is a movie that you tell your friends about. Bad Ben follows Tom Riley (literally the only actor in the movie) after he purchases a house from a sheriff’s sale. He has put all his life savings into the house so that he can flip it and sell it at a profit. When he arrives at the house, he discovers that a lot of valuable furniture has been left behind. What he also notices is that several security cameras have been set up throughout the house. He beings to play with the system and eventually learns how to work it. Thus Tom’s story begins to unfold in both his camera footage and the security cameras. As with many of these found footage movies, poor Tom begins to mess with things he shouldn’t. He throws away the religious items. Desecrates a grave. So Tom messes with things, and things begin to mess with Tom. It starts with the furniture moving. Then it’s noises in the basement and attic plus a horrible smell. With a bit of sleuthing, Tom finds out that the previous owners were murdered in the home. It’s from there that he begins to unravel the truth behind the grave in his backyard and what sinister things are really happening in the house. Bad Ben was solely acted, filmed and directed by Nigel Bach. If you’re not into Nigel’s character Tom, chances are you probably won’t care about this movie at all. But I quite liked Tom. He isn’t likable, per se, but like all of my favourite found footage films, he felt like a real person. And if the people feel real, the eeriness of the haunting will feel real too. Sure, you are ultimately watching a guy who dresses like my dad walking around his house doing things my dad would like to do (ie mowing the lawn). And you have to suspend belief a little bit. I mean he talks aloud to himself all the time. But this movie is still really watchable. I love the story behind this film. I love that it was Nigel doing this all on his own (with some help, I’m sure). It’s basically what we’ve all wanted to do: make our own damn movie. It’s pretty easy to feel cynical about big budget films. A lot of the times they really feel soulless. It felt really good to watch something that had a creator that was obviously passionate about what he was doing – and was clearly enjoying the hell out of it. Bad Ben is weird. Bad Ben is wonderful. And it has absolutely won my heart.